SCPD responded after a boat had become lodged in the rocks by the Huntington Lighthouse on on June 17. SCPD rescued two boaters in Huntington Harbor. Huntington, NY - June 18, 2018 - Suffolk County Police Marine Bureau officers rescued two boaters who were stranded on the rocks at Huntington Lighthouse in Huntington Harbor. 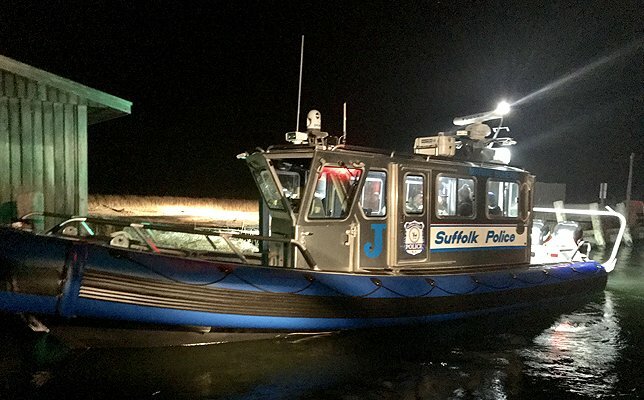 The Huntington Harbormaster requested assistance from Suffolk County Marine Bureau for a boat that had become lodged in the rocks by the Huntington Lighthouse on June 17 at approximately 8:00 p.m. Marine Bureau Officers Terence McGovern and Kevin Yoli responded aboard Marine Bravo. The officers tied a line to the stern of the 38 foot sailboat in an attempt to free it. A boat from Sea Tow arrived and workers secured a second line to the mast of the boat and rolled it on its side allowing Marine Bravo to pull it away from the rocks to safety. After the boat was freed from the rocks, officers did a visual inspection of the boat and conferred with the boat’s owner, Jorge Schneider, 71, of Huntington. It was determined the boat was undamaged and Schneider and a female passenger were unharmed. The pair remained aboard the sailboat and were escorted by Sea Tow to shore. Subject: LongIsland.com - Your Name sent you Article details of "Stranded Boaters Freed from Rocks in Huntington by Suffolk County Marine Bureau"